Foundational business books for success. Explore the 50 inventions that made the modern world. There is rich advice in the literature of start-up development. Learn about the interconnectedness of innovation and business development. What’s the Lumina Prize? You could have the winning idea! We're unearthing the next big idea in post-high school education. Is it yours? Lumina Foundation is partnering with Big Think to unearth the next large-scale, rapid innovation in post-high school education. Let's lift Americans up the economic ladder and redefine education and training for the new economy. Lumina Foundation is an independent, private foundation committed to making opportunities for learning beyond high school available to all. Its goal is to prepare people for informed citizenship and for success in a global economy. Enter the Lumina Prize below. Here's what it means to be a good leader—no buzzwords, no bullsh*t.
The psychology of leadership is a mess, says Jordan Peterson, because it's clouded by "management idiot speak." One example? A leader's job isn't to motivate people; it's to tap into people's sense of purpose. Motivation is the byproduct. Lead your team like a free society, not a dictatorship. Based on developmental psychologist Jean Piaget's observations, Peterson emphasizes the importance of an equilibrated state, which is "a situation that's set up by two or more people where everyone is participating in the state voluntarily." Authoritarian-style leadership ("Do this or else") is a terrible way to run a team. Good leadership means finding people who want to contribute. Otherwise, says Peterson, "the enforcement costs are so high that the free society will outcompete the authoritarian society across time." Could this be the long-awaited solution to economic inequality? Under capitalism, the argument goes, it's every man for himself. Through the relentless pursuit of self-interest, everyone benefits, as if an invisible hand were guiding each of us toward the common good. Everyone should accordingly try to get as much as they can, not only for their goods but also for their labour. Whatever the market price is is, in turn, what the buyer should pay. Just like the idea that there should be a minimum wage, the idea that there should be a maximum wage seems to undermine the very freedom that the free market is supposed to guarantee. Can you be happy and successful? Dark horses show us how it's possible. The Dark Horse Project is a long-term study run out of Harvard's Graduate School of Education. It examines how people achieve success by harnessing their individuality. What dark horses have in common is that they use fulfillment as a path to success—not the other way around. How do they do this? By investigating and understanding their motivations—that is, knowing fully what they want and why they enjoy the things they do. 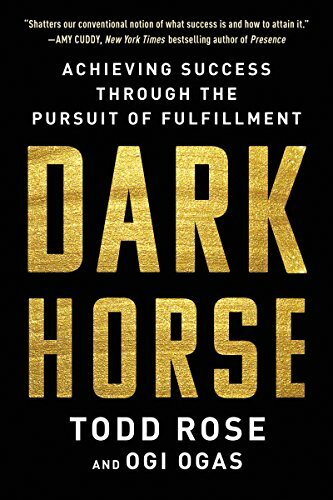 Todd Rose, author of Dark Horse, explains how to pinpoint your own individual motivation and the huge impact it can have on goal setting, happiness, and success.